00:15 Welcome to the live, happier, longer podcast. We’re your hosts, Molly Watts and Angela McDade. We are here to help you build the habits of happier, longer life starting now. 00:28 Hey Angela. Hey Molly. How are you this beautiful Tuesday. I am well, how are you? I’m excellent, thank you. It’s like 70 degrees outside. Have no complaints. Yes, because in Oregon, spring has sprung. That is right. It is beautiful and we’re loving it. So our daily actions, number three is share. And it’s really focused on combating social isolation and loneliness in seniors and in older people. And we say it’s an actionable habit. Yeah. We’re really all about creating that habit of connecting and engaging and staying involved in community. And today on the podcast, we’re talking to somebody who is equally passionate about, um, combating that. Yeah. Because it’s a, it’s a problem, a morbidity problem for seniors. This is not just a feel good thing. It’s not, it’s just a shame. They’re lonely. It really affects their health related to their health? It’s is is bad for you as smoking up to 15 cigarettes a day is social. It’s just mind blowing. Yeah. Loneliness and isolation. Today we are talking to Dr Kerry Burnight. She is a gerontologist and the chief Gerontologist at GrandPad. We’re talking to her about a technology that they have created that is designed specifically to combat this problem. Yeah. And it’s designed in a way that elders can use the technology and create a really great community within the family and friends that is only met through that one piece of technology. Right. And it’s a safe place and it’s combating elder abuse as well. So it’s just a fantastic idea a fantastic product and we had a great time talking with Dr Kerry Burnight. 02:17 Hi Kerry. Hi Kerry. 02:20 We are so excited to have you here. We really appreciate you taking the time to talk with us. We just gave a brief introduction on your title, your background and a little bit about what you are doing now with grant pad. So just excited to have you here and again, appreciate you taking the time. 02:38 And I am grateful for the work that you’re doing because there is so much good news surrounding aging and I’m just delighted that you are sharing that. 02:46 Awesome. So let’s dive right in and start with a little bit about your background. I know that you were a, an instructor in Gerontology at the University of California Irvine and then you were working, um, with a, uh, on elder abuse, which I think kind of led you or are started you down the path of where you are now. 03:08 Yes. So I had nearly 20 years as a professor in geriatric medicine and during that time, what we continually saw was the hidden epidemic of elder abuse, neglect and financial exploitation. And so I spent nearly 100% of my time working with law enforcement and social services and the district attorney working to help older adults get back up after feeling the shame of, um, treatment or exploitation. Although we were able to serve thousands of people and I felt very grateful for the opportunity. The problem was that it’s too late. Once people have endured that, if you already then you know, often your money is gone or the impacts your health. So what we as a nation in fact as a world needed to do is get to the root cause of what’s causing the vulnerability and article that we published in the Journal of the American Geriatric Society. We saw that it was isolation and loneliness. That was one of the very biggest risk factors. 04:34 Obviously even more recent information has come out in the last couple of years on the impact of cell phone of loneliness and isolation in terms of morbidity for uh, for people. And so I know that, that, you know, there’s the link between or the, the comparison. Yes. Between cigarette smoking, which is mind boggling, you know, because everyone understands how bad cigarette smoking and to compare it to loneliness. It’s hard to belief, you know, that has to same morbidity. Yeah. 05:07 Being chronically lonely as defined as wanting more social interaction than you currently have as the same health hazard as smoking 15 cigarettes a day. And those that are chronically lonely, all things held constant die at a rate that’s 25% greater. And then the one that really is perhaps the most flooring to me is the connection, the very direct connection between dementia and loneliness. And so a study that is quite rigorous was showing that it was a 64% increase in cognitive impairment. The great news is we really can do something about this. Yes. It’s one of those risk factors that we think, wow, even though it’s awful, we needn’t spend time lamenting how awful it is because there are things we can really, really do to eradicate loneliness. 06:14 But we’ve shared a little bit with you about our format and our five daily actions and we, we have daily action. Number three share, is all about combating that loneliness and isolation. And you know, we say it’s an actionable habit. Something that people, you know, in Midlife and earlier even you need to start building the habit, right? Taking action all the time so that it’s, it’s forefront so that they understand that it is, it’s, it is an impactful, yeah. It has a long term effect. Right? And you can start now, but you have to, you have to create a habit of it. I believe you have to really keep at it. And I know that as, as you get older, it doesn’t get easier to create those habits. And so your journey took you in, in terms of that understanding how important that was to your work with GrandPad. 07:04 Yes. So from running an elder abuse forensic nature for so many years, um, I thought we have got to connect humans and just in the same way that we need to eat and we need to sleep, we need to connect from the day that we’re born. And we know that infants who are not connected and held that they don’t form the same way. So from the minute we’re born, we need this. And I love what you said, that it takes effort to form these connection. Every one of us need it although we can need connection in a different way. So from that, I thought, okay, let’s connect humans. And my first thought was not technology because I’m a very in person kind of person. And so my first thought was there’s a lot of people in the world who need additional connection and there’s a lot of people in the world who would like to help. So all we need to do is connect those human. So I created a nonprofit called Ageless Alliance and its intended sort of the mothers against drunk driving for the topic of elder abuse. Like it’s putting the word out there that this exists. And in terms of prevention, we’re trying to not only raise awareness but also connect humans. So we worked really hard and we’re still working hard, but to background check, uh, adults and connect them with older adults who haven’t anyone in their life. 08:44 And those friendships that are formed are really helpful. So the great news is that it works how ever and the however was huge. It’s an enormous amount of work. And as hard as I worked, you know, all day, every day I could connect maybe you know, 20 people or if I was a hundred people and it does really matter. But it wasn’t scale able. Yeah. Next step we became, what can we do this but address the fact that there are hundreds of millions of us who would benefit from this connection. I tried to take standard technology, for example, an iPad or computers and try to connect people that way. Problem was that these standard devices were not intended and not smartly or sophisticatedly designed for my patients for those 75 and older, 80 and older for my beautiful patients in their nineties and one hundreds. So I was growing quite frustrated with technology, as many of us do. And once Glorious Day, I found a patient who had in his hands a device that really, really works for him. And this is called GrandPad and it’s called Grand because we’re trying to enable people to live grand. So I was fortunate because I was in physical proximity to the company and I was able to go over and meet with these technology gurus. And um, my initial intent was, gosh, I wonder if I might, you know, get GrandPads for my patients. But after I saw what they were doing, I quickly thought, wow, this could work. And in fact it does work. I’ve been full time at GrandPad as their chief Gerontologist for three years and I am watching lives improve and change. I’m watching people regain their dignity and it’s been really rewarding. 11:10 Yeah. So I, I, I want to dive into more about the GrandPad itself and what it actually does. But I know that one of the things that I’ve really loved about the story about GrandPad and the company is that you have a wide range of people and ages. He’s that and in fact employ people in their eighties and nineties to, um, as advisers and such. Yes. And that’s the whole difference. Um, our oldest paid employee is 104 and turns 105 in April. And we’re really looking forward to that. And this is what makes GrandPad so different. And that is every step of the way, every decision, every, you know, I mean, there are literally millions of decisions and creating something new was guided by the wisdom of the users. Older adults could say to us, I don’t care about that feature. Don’t put it on there. That complicates it? I don’t want it just like remote controls to our televisions. Why it has a thousand buttons. I don’t know. I just want to turn it on and off and change the channel. So GrandPad listens deeply. There’s a continual iteration of listening, making improvements, listening, making improvements. And what we learned is that people want it to work all the time. They don’t want to be made to feel stupid. And there is no reason. I mean it in our later adulthood. It’s the greatest time of wisdom and actually it’s the greatest time of integration between the left and right hemispheres of our brain that is the greatest time of problem solving. So by listening to older adults and listen how they problem solve, we’re able to take that wisdom and put it into a technology that works. So yeah, our youngest employee I think is 19 and our oldest is 104 and uh, much more than a half. And we have a group of, we call them grand advisors who sit together, talk together here in the office and I every day, I’m so grateful for them. 13:40 That is awesome. I love the fact that you have advisers that are, you know, your end user. And so that just makes the work that you’re doing more specific and more dedicated and more likely to work, which is awesome. One of the things I remember from hearing a talk that you gave before was something about, uh, the finger pads that as you age and tell us a little bit about that. 14:07 And that’s what we learned from one of our users. And she was 114 years old at the time. Anna. Beautiful Lady who lived in her own home. Um, and what we learned from Anna was that she would, when we used a standard device, she would tap just as she was supposed to and nothing would happen. And so she grew frustrated at herself when in fact it was the technology failing her. And the reason for it is that as we get older, often in our 90 sometimes earlier the pads to have our fingers grow dryer and it is the moisture in our fingers that enabled the screens to register at tap. With that we needed to use a screen on the GrandPad that is really sensitive so that you can have as dry fingers as I do and it will continue to work. There were hundreds of thousands of modifications like that to make the device more sophisticated. And I think the greatest misconception is that older adults need things that are more simple or dumbed down. It’s actually the exact opposite. It needs to be more sophisticated, intelligent. Right. So because as we age, we all are going to have changes and it is natural. We will have vision changes, we will have changes to our hearing, some, some of us will have cognitive changes, some of us will have mobility changes and that’s why design needs to be smarter as we get older. 15:58 Yeah. Just to adapt to a broader range. Yeah, I know that. So I don’t want to, I mean I know there’s a lot of things that the the GrandPad does, but let’s talk about the main features that are really appealing to both the users and their, their caretakers or their extended family and the people that are really, um, people that they’re connected to. The tree of life that is involved with that person. 16:25 Yes. So, um, the way it works, it’s a lot of times it’s like, I’ll use myself as an example. So I am 50 and my mom is 90 and so she has, she has a cell phone and a computer and there are a constant source of frustration for her largely because the passwords and the WiFi and you know, the size of the font on things. So what I did is that I was able to, before I was an employee, I purchased that GrandPad and some people go online to purchase. It’s also available at targets stores. And when I purchased it I wanted, there’s a principle that we have called the 90 90 rule and that is a 90 year old needs to be delighted in 90 seconds. We’ve been so burned by technology traditionally that it makes every bit of sense in the world that if you’ve been burned by something, you’re not going to be accepting of it. 17:37 So people say, I can’t understand why my dad won’t, isn’t open to technology. I’ll say like look at his experience with it. If you have been burned and made to feel less than with frustrating stupid technology, you’re not going to want to adopt. So anyway, so then through um, like for me, I did it with a computer. It was real easy just to put on the pictures and then when it arrives in the mail and through the wonder of the cloud, when it arrives at her home, it already has all of her contacts and our pictures and it also has our family photos and then some of her favorite songs so she can, and we even got rid of the on and off button. So the box arrives with no twisties. You can just take a finger and open up the box, take it out, open the cover and it’s on and you’re looking at your kids and grand kids. And that is the 90 90 so that in 90 seconds you can think. Yeah, yeah, yeah. And everything really be that way. So that you engineer out the frustration. 18:49 Really, I mean honestly the, I mean let’s not let like make that about people in the 90s I mean, good Lord, I have got a boatload of things that frustrate me about technologies. So it’s a, it’s a wonderful initiative regardless of the age, but certainly even more important when people are, as they age and have become even more experiences that are negative for sure. 19:14 Yeah. So what usually is the first thing that people fall in love with is the photos. And so, you know, what happens is that the older adult has a GrandPad, but then what we call the circle of trust, and that is all the loved ones and friends and colleagues can be connected with that GrandPad on their traditional devices. So for me, I, on my iPhone I have the free GrandPad APP. When I take a picture, I can easily with one click, send it to my mother’s GrandPad and it comes up automatically. And so she then keeps your GrandPad on the wireless charging station and those photos scrolled through and we’re all adding to them. And then it’s actually made my whole family closer because when I post one, it also goes to everyone’s phone and then everyone comments. And then my mom, because the typing’s harder, she uses her voice to comment. So she presses one button and she said, oh Kerry, it looks like you’re in Scotland today. Fun that is. And so eager to hear precious mother’s voice comment. So that is one feature. That’s just the photos. And she also take pictures with her GrandPad and shares them with us, which has been terrific, actually been practical because she recently had a hospitalization and she took a picture of all her, um, prescription medications and made it all so good that we then all had that from her in a timely basis. 20:57 And then I think the second thing that people love and it is also the antidote to loneliness, is the ability to easily touch a button and be either calling or preferably in my opinion, video calling instead of connecting with an existing like face-time or Skype or these kinds of things that have a few steps. This is just press, press the button. Yeah, Molly and then Molly on her phone and your mother on the GrandPad are talking and the ability to see someone’s face and particularly in their mouth when some of us are have hearing challenges is yeah, and then on top of that some of our people really can’t hear and even lip reading becomes challenging. So we’ve incorporated real time texting so that I’ve seen the conversation I could be saying I so look forward to seeing you on Friday. And then if my mom is not sure if I said Thursday or Friday because they look similar at the same time, I’m typing in Friday and it comes up on her screen. So then we definitely together it’s really connecting humans and it says important who you connect with as it is who you don’t connect with. And in our, in the United States, um, financial exploitation of older adults is a $37 billion industry. 22:41 The way they reach us as older adults is through standard technology is even through your land line computer scams. So what we have is a closed network of those in the circle of trust. So you could have everyone you want and exclude everyone who is out to scam you of your money. My mom has been a terrific part because she was, here I am a gerontologist working in the field of financial exploitation and my own mom while I was at her house, got a call from a young man claiming to be her grandson and he was so good at what he was doing that she was talking along and you know, he was in some trouble and just my God’s grace, I was there to say that sounds familiar like what I deal with at work. So I said, may I speak with him? And when she handed me the phone, we talked for a bit and it did sound like one of her grandsons. Um, but when I probed into it more than he then quickly hung up, you know, they are so sophisticated and then they’re scamming or pretending that they’re the IRS or, so many people are scamming. 23:57 It’s just that immediacy, the being able to connect to your, that, that trusted circle quickly. I mean, could also save potentially, even if they’re getting an email on their computer, they could ask somebody and say, Hey, I got this. You know, and so that’s that. Yeah, that is a fantastic, a fantastic way to help us set that. And I think, you know, the, the, the, the person themselves, but I think the fact that you are, you have that whole circle. I think if you’re, whole circle are so interconnected, that in itself is a whole other level of connectivity that like you could see, oh, my sister did this and and grandma knows about what all the kids are doing and all the children, you know, all the grand kids are doing. And it connects on such a larger base than just, you know, parent and child. And I think that in itself is amazing. Well, and so many of us, I mean, as you can tell, Angela’s not from the United States and her family is still all the rest of them all in Scotland. So being able to cross that boundary seamlessly for the whole family and, and incorporating it through the grandparent is also kind of empowering to the grandparent as well. You know, that they are the, they’re still, yeah, there’s still the, the, you know, the chief person. Right. 25:25 That is right you really understand. That’s exactly right. Put the senior in the center. Also reduces sibling discord. You see when only one sibling knows what’s going on with that loved one in their life, problems happen. So what happens is, a child who is not connected to their parent has different perceptions of what it, you know, what life is like for the parents. So I have a lot of times people would come to my office as Gerontologists and say, I am so frustrated because my sister is not helping us at all. She doesn’t know that our mom is alone and needs help and is not paying our bills properly and these kinds of things. But this way let’s put everyone together so we have the same information. And so that actually a lot of times it’s, it is like, let’s say if you have one person, unfortunately there are people in families and all of our families maybe have problems with drug abuse or mental illness or something like that and they maybe are taking advantage of a widowed older mother in to get money from her. 26:47 We hate that it happens, but it does. But by connecting that whole circle, those siblings can be in on what’s happening and say, wow, that doesn’t seem right that my brother purchased a truck with my mom’s money. Explore what’s going on here. So it is a transparency within families that is good because it’s good for our heart, but it’s good because it’s also good to acknowledge the realities of know. It’s like getting older can be lovely but it’s not easy and our, our whole honest, open connection in order to maintain the dignity that we all deserve as we age. 27:35 My mum has a phrase and it is “age doesn’t come in its own” so there’s always something else coming along with it. I just think that’s a great saying. 27:45 What a wise, I love that. Age doesn’t come on its own. That’s very good. I need to get her name so I can quote her. 27:59 Mary Blaney. The app itself is just, I’m want to ask that technical question. So the, it’s unlimited as far as the number of people that could be in the inner circle or the circle of trust and it’s just as easy as an app on their phone. 28:14 Yes. Yeah. It doesn’t cost anything and it’s what enables you to connect and send pictures easily and you know, all the updates. And what is also lovely is that someday, unfortunately we will lose our loved one as they passed away. And we don’t ever say, okay now all the information and memories and connection that is shared, like those voice recordings and everything, you will always have those. So we want people to continue their family connections. And so it’s a nice legacy. And I am so grateful that I have both the recorded audio of my mother but also the recorded video of our conversations of my mother because after my father died eight years ago, the only thing that I had was um, on my answering machine, it was his voice. And when I got a new phone it, I somehow lost it. I would give anything. So now I think, oh, I have so much lovely, wise wisdom from my mom, both her voice and also these videos. And I will always have that and I’m really grateful for it. 29:28 That’s awesome. I love that. I love, I love the whole thing and I think it’s just a fantastic, as we said, our daily action number three is share daily action number two is learn. And we’re all about creating habits for a happier, longer life. And while we have, we focus on, uh, you know, these actions and we have a physical, a physical planner journal. This, it doesn’t conflict at all because this is just what another tool for creating that habit of, of sharing your life and making it easier and making it user friendly for people, especially as they get into their eighties and nineties is just a fantastic thing to do. 30:14 I am grateful for the work you’re doing because I really agree with that. And I have found as a, you know, having my doctorate for all these years. Where you’re saying is exactly right. Um, we’ve talked about pictures and video calls, which is terrific, but I wanted to point out another thing that I believe very much in being high tech and high touch. So there’s a button on the GrandPad that you can unlimited time pressed that button and you are connected with your, what we call member experience agent who knows you and humans that you would never press one for this, press two have this incredible team in Minnesota and Iowa who are largely women and work out of their homes and are the best and most untapped it force of compassionate humans. So that if you had a question about anything, you press that and you know, they would say, Mrs. Jones, this is Chelsea who we’ve met before. Similarly, if you weren’t using your GrandPad, we would look to see if it’s not charged and we get an alert and then we reach out to our members and say, Oh, you know Mrs. Jones, I see that you’re GrandPad, it isn’t charged. Can you place it on the charger to make sure that it’s charged? And what’s lovely about that is not only the relationship that’s formed with the member experience agent and the older adult, but also it gets adult children out of the business of being the IT guy. Because we don’t, we want to use our time with our parents on other things besides just fixing technology. And Yeah, for me, for example, I don’t even know how to fix standard technology very well. So this is a nice way. And then at a question that people often ask me, they think, well, what about WiFi? 32:43 And so what we found is that a lot of homes either don’t have WiFi or it’s not a very fast or they don’t know the password as often as the case with all of us. So what we did is we engineered that out so that it’s an LTE network that just works everywhere so you don’t have to have WiFi and because that you can take it everywhere and it will always work. And so that’s why we really, the form factor was important to enable you to take it to your doctor’s appointment and to take the grand pad everywhere. And then the other things is that we put on 30 million songs because I know that one of your actionable habits is learning. And I want it to touch on the incredible, um, cognitive benefit from emotionally salient music. So it isn’t just music, it’s because music that is emotionally salient is stored in a different part of the brain. 33:20 Right. And so a number of patients in the advanced stages of Alzheimer’s disease who we have specifically loaded their GrandPad, with like this one patient I’m thinking of, she had hymns that were really meaningful to her from her childhood in the south, even though she’s nonverbal, she’s able to sing the words and there’s the halo effect that occurs after. And that is, she’s able to say how often she’s able to say a few words after she’s sung the music to songs in the last time I was there, she kept repeating the word lovely. And I stood there and I listened to her say lovely and I looked at her daughter who hadn’t heard her voice in a while. And I had, if there was a medicine that worked as well as just that. And there’s no side effects and it’s enjoyable. And this older adult lived in a skilled nursing facility and I, I watched her joy and then she also had a roommate and the roommate had such joy just enjoying the joy of her. 34:31 Yeah, yeah, yeah. Cause it’s infectious. And I am in a former life, I was a nurse and worked in geriatric care for awhile. And, and it just as you say, like the word lovely. I have had that same expedience. They don’t say that. Like they have a few words. And having an experience like that is, it is such a joy to watch. 34:57 It is, shows us that learning, using our mind, maximizing our cognition is a lifelong, uh, imperative. And there’s no, there’s never a point where you go, oh well they’re past that point before you die of advanced Alzheimer’s disease. There’s cognitive functioning that we can enhance through connection, through learning, through music, through touch. So there’s really so much we can do. And we, for example, put, um, games that we specifically created onto the ground pad that are not just apps from other redesigned at all in order should be rewarding in the same interface and stimulate cognition. 35:43 Similarly, we put articles that are specifically of interest in different people and we customize that. So we have some users who said, I’m really interested in, for example, in space, in a NASA, they have content every day that is of their interest. Whereas if someone else, you would think that’s the last thing I would want to read what I’m really interested in. Again, we learned that from seniors. We had some seniors who said, I can’t have a pet anymore where I’m living, but I really love cats. And so we created specific, we didn’t think of it, but they let us know. Like I’d like something that would be a cat of the day and it would be a cat and we would talk about it. And so we created that. Whereas other seniors like my mom for example, said I’m not at all interested in the at of the day. That’s so silly. What I want is news, like really hard hitting news. I want, that’s what I want to keep up with. So we become more different as we age and so we need to have a solution that works for everybody, but that is customized to the individual. So that’s where the dignity comes in about finding out what people would like and then providing it to them. 36:54 I love that the whole product is just fantastic. And I know you guys have recently, or I think it’s pretty recent, the partnership with consumer cellular and on a monthly basis there’s a fee and ongoing fee for service that covers all of the right, that covers all of this customization. 37:12 Yeah, we were, we tried to, again, listening to older adults and their families find out and what we learned was don’t lock me in with a contract. I don’t like that on my phone that you feel so. So what we did was we, the price is $200 and then, and so that’s for the device itself. That’s for the actual, yes, exactly. We also learned that people said, well, I’m worried. Like, what if I break or lose the device. So we took that out. If something happened to it, we can remotely program another one exactly the customized way you had it and send it back out. So it’s insured in the sense that you can’t break it, you can’t lose it, you’ll always have it. And then everything is included. The three 30 million songs and email and phone and all the unlimited, all the data that you would need for $40 a month. So what we found is that a lot of times families would come together as a gift, give the GrandPad for $200 although for mothers day 2019 I believe that there will be a special, that can be $180 but generally $200 and then you give that gift that arrives delightfully to your mother or grandmother or grandfather and then the $40 a month and covers everything. And we don’t have the older adult have to put in their credit card or do things that could open them up to any kind of exploitation. So I have found it to be the gift that just keeps on giving and to see lives changed for that is really, really rewarding. 39:06 Yeah, absolutely. Incredible. Yeah, we appreciate you taking the time to talk with us today. It has been just wonderful to hear all about your experience and GrandPad and what it’s doing for seniors now and what it will continue to do for seniors in the future. Just appreciate it so much. 39:25 Yeah, well I am love with what you are doing and then you need it. 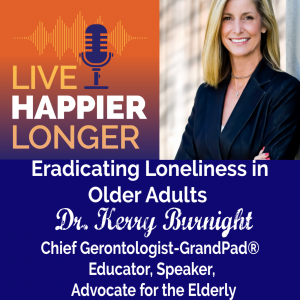 Need to say get the word out so I can’t wait to recommend this podcast to all my friends and colleagues and to all of them beautiful older adults and their families that I get to work with. 39:39 Thank you. Thank you so very much Dr Kerry Burnight and GrandPad. Yup. Thank you. Bye Kerry. 39:48 Thanks for listening to the live happier, longer podcast. Now it’s time to move, learn, share, give and let go. Five daily actions to make the rest of your life the best of your life. See you next week. 40:04 Okay, so just a quick word before you go, if you haven’t already clicked that subscribe button on our podcast. We would love you to do that and we would also appreciate any feedback you have for us. Positive ones would be excellent. What will take anything you have to say and for a free copy of the Five for life planner head to fiveforlifeplanner.com and download your free PDF today.